This music is the result of the extraordinary collaboration between G.I.Gurdjieff and the Russian composer, Thomas de Hartmann. Gurdjieff traveled for twenty years in the Middle East and Central Asia to discover and develop the teaching which now bears his name. In the 1920's he and de Hartmann worked together on the music included in this collection. 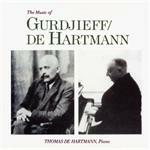 These are the only recordings available of Thomas de Hartmann himself playing the music he composed with Gurdjieff. "The Music of Gurdjieff/de Hartmann" is the result of the extraordinary collaboration between G.I.Gurdjieff and the Russian composer, Thomas de Hartmann. This recording is the 3 CD Box Set.